It will certainly be a bit of challenge when explaining to your guests that this year there won’t be any chocolate on the Christmas table, and even more when you tell them that your Christmas log will not only be chocolate-free but also dairy-free! 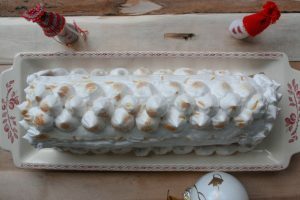 This Vegan Lemon Meringue Christmas Log is such a delight, the slightly tangy and creamy lemon curd goes perfectly with the sweet and smooth meringue. This Christmas Log will please everyone, even the chocolate lovers! 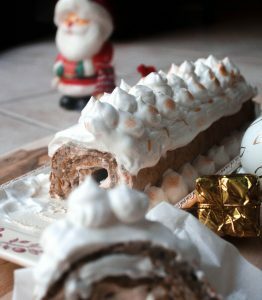 Even the chocolate lovers will ask you for more of this delicious Lemon Meringue Christmas Log – a dairy-free and refined sugar-free delight! Drain the can of chickpeas only to keep the water-bean. Pour the water-bean (called aquafaba) into your mixer with 1 tbsp. of superfine cane sugar and 2 tsp. of lemon. Whisk for a minute while gradually increasing the speed of your mixer. Incorporate the rest of the sugar 1 tablespoon at a time, increasing the speed of your mixer gradually and this for 1 minute. Proceed in the same way until there is no sugar left. Next, whisk (without stopping this time) at medium speed for about 10 minutes or until the meringue is firm and glossy. Keep in the fridge until ready to serve. Preheat your oven to 180°C. Line a Swiss roll tin with baking parchment and brush lightly with oil. Cover the flaxseeds with water and let them sit for about 5 minutes. In a large bowl, combine the dairy-free milk and apple cider vinegar; set aside for 10 minutes. In the meanwhile, mix together the dry ingredients. Add the flaxseeds and rapeseed oil to the dairy-free milk and whisk. Next, add the wet ingredients into the dry ingredients and gently fold in the whipped aquafaba. Pour in the cake mixture into the prepared tin and bake in the oven for 20 minutes. Cover the sponge cake with a clean and wet tea towel and roll it up. Let the cake cool a little. Uncurl, spread the filling and gently roll up the sponge again. Start making the second whipped aquafaba for the meringue that goes on top of the log (follow step 1). 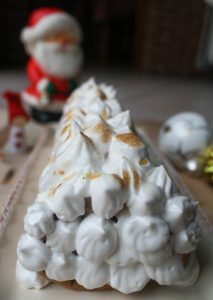 Pipe some meringue on top of the log and using a blow torch brown the meringue. Alternatively place the log under the grill of your oven for a few minutes (watch out you do not want it to burn!). I personally prefer the kitchen torch since the meringue holds its shape better. I hope you try and like this recipe, if so let me know! Share on Pinterest (click the picture) and tag a photo on Instagram #mimies_delicacies so that I can see your lovely creations as well as helping me reach more of you lovely people. Merci my friends! Particularly I love the lemon meringue all around the year. But it’s true that in Christmas is a dessert more tasty and very nice, because it seems like snow.